The Antelope Valley Transit Authority received big news in November 2014. 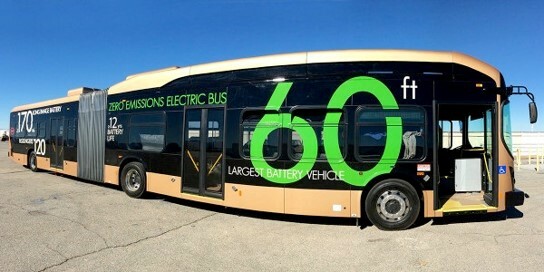 The board that governs the AVTA decided that all buses in the fleet will be replaced by 2018 with electric buses. With $39 million (USD) coming from Federal and State agencies to cover some cost, the AVTA will need to identify additional sources. In the end it is estimated to be 5-10 years before the full build-out. The first of the new E-buses under the new mandate are set to enter service beginning in 2016. With this many E-buses in the fleet, infrastructure for charging requires novel approaches. As part of the funding, the ATVA will install 85 hard-wire stations for charging, but also up to 11 wireless charging stations. With this charging infrastructure in place, bus service should be seamless. In addition to the novel charging approach, the ATVA is also utilizing their solar array to power some of the chargers. With a steep learning curve, having only received their first two E-buses in 2014, the AVTA is approaching the mandate with an all-hands on deck attitude. Working collaboratively with the local utility, ATVA is hoping to avoid future issues with energy supply. This includes the installation of 2 x 1200V lines to increase the electric capacity currently offered. While the AVTA only has 200 employees, the small size has allowed them to respond quickly to the mandate.